Last week I spent a few days in Nashville for Summer NAMM. People have told me for years that Summer NAMM is a far less interesting show than Winter NAMM, so I wasn’t expecting much. This year Summer NAMM was held in the new Music City Center which is a beautiful venue. Summer NAMM was, I think, the first event held at the center. It’s very new, and very shiny. The parking design was amazing. Traffic was light, parking was directly under the building, and finding a space never took more than a minute. The “strip” on Broadway was a quick five minute walk away. Great location, great parking, and very helpful staff. Big win for Nashville in my opinion. Flights, lodging, car rentals, and meals are expensive, and attending a show like this delays my production schedule. But for five years I’ve been running a business that almost no one (where I live) understands. The primary reason I attend these shows is the people. It doesn’t matter how much someone likes what you do, some conversations only happen when you’re in the same room. These shows represent an opportunity for me to interact with other people who understand what it takes to create products that make musicians happy. Brian Wampler builds some of the finest overdrive and distortion pedals available. His new pedal is a slightly different take on the classic fuzz pedal. Brian told me that it’s designed to emulate the sound of a fuzz going into a cranked Marshall amp where the saturation of the tubes “softens” the edges of the fuzz. They’ve put together a promotional video that does a pretty good job of capturing the real-world sound of the pedal. It features the playing of Travis Feaster, a very talented blues rocker, and Wampler employee. 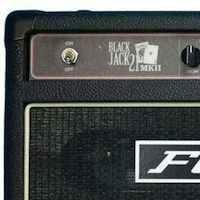 Fuchs amps have been at nearly every amp show I’ve attended since 2008. A few times I actually waited in line long enough to play one, they tend to draw a crowd. I was always impressed, but as a Fender tone lover my Samamp amps have been enough to keep my G.A.S. at bay. Last November I discovered, and soon endorsed, Zexcoil pickups. 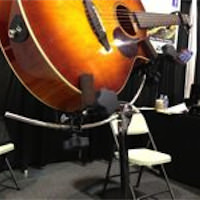 Fuchs and Zexcoil often share booth space at guitar shows. As a result, I’ve spent more time playing through a Fuchs amp in the past six months than in the previous four years combined. The Fuchs tone is very thick-sounding, very solid. Even at high gain settings it’s very articulate. It’s a different sound than what I’m currently getting. Not really Fender-y, not really Marshall-y. Just,really, really good. This week I took the time to play through the Casino series amps: the Four Aces, the Lucky Seven and the Blackjack 21 II. Andy was kind enough to explain some of the rational behind the designs, the similarities and the differences. They just sound really…..solid. Wish I had a better term for it. The reverb circuit on these amps is very cool. Listening to it, you’d never guess that it’s a digital circuit. I’m not a huge fan of traditional Fender reverb, way too “drippy” for me. Level and Decay controls make this reverb circuit far more usable than spring reverb. Not gonna lie, I was pretty excited about this chair. The physical discomfort of sitting for hours in front of a camera is one of my least favorite parts of my job. My current “guitar” stool is,well, not great. 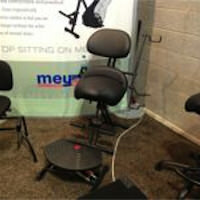 The Mey Chair Systems booth had a variety of chairs and stools on display, I tried several. 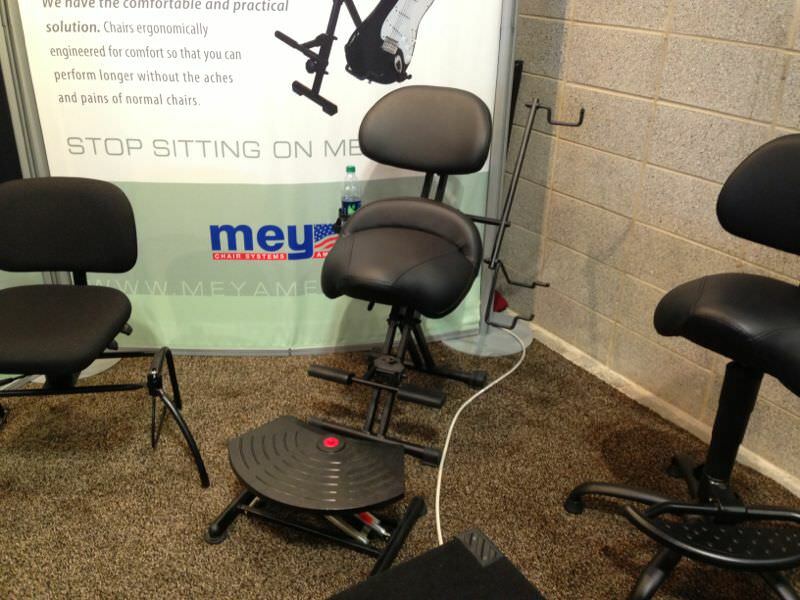 The best one (pictured), has an integrated guitar stand, an adjustable foot riser, and a cup holder. It is incredibly comfortable. This particular model doesn’t appear on the Mey America website yet, but I found it on their German site. 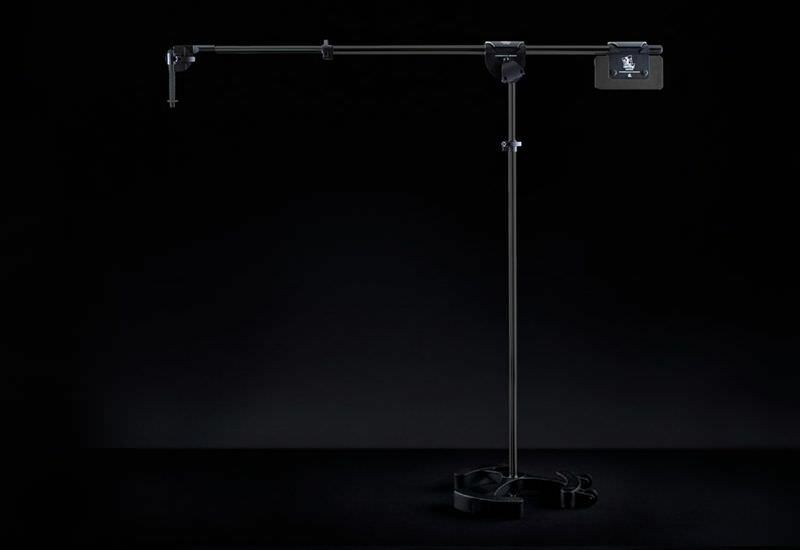 Latch Lake Music - micKing Stand. My primary camcorder cost more than any of my guitars. A few weeks ago it tumbled off the top of my tripod, saved only by the attached cables. Why? Because the plastic tripod “locking” mechanism came loose. I was not happy. 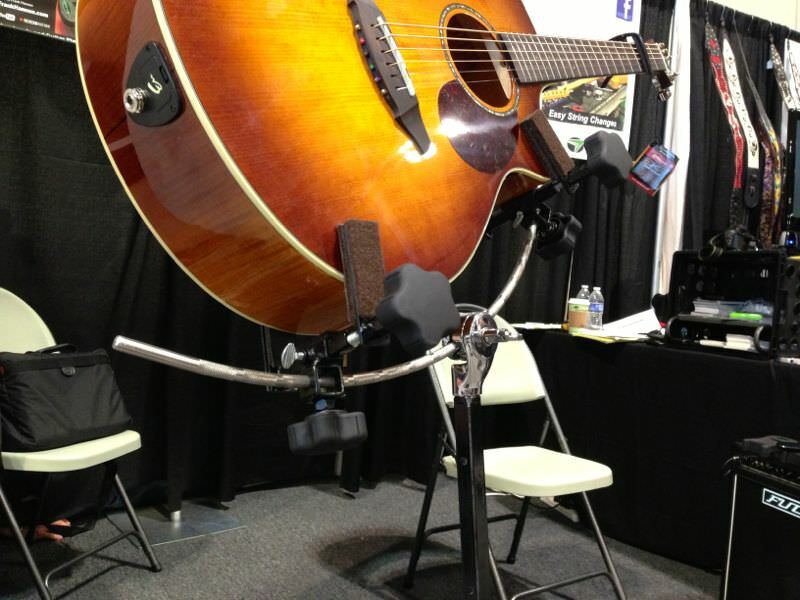 In the Latch Lake Music booth I discovered the micKing - an industrial strength boom stand. It’s all metal, very steady, and incredibly strong. I’d feel much safer with my camera hanging from one of these than my current tripod. One of the signature aspects of my videos is the “player’s perspective” camera angle. For the past few years I’ve been using a mic stand with a guitar mount to keep the guitar steady. It gets the job done but just barely. It’s difficult to adjust, not very steady, and prone to tipping. I am so, so glad I stopped by the Re-Axe booth. 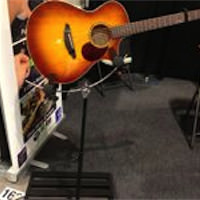 In September they plan to release this “Arc” guitar stand. It has everything my current stand lacks - steadiness and adjustability. The arc-shaped rod allows you to rotate the guitar side-to-side and front-to-back. It can even be attached to a pedalboard (pictured), or a mic stand base. 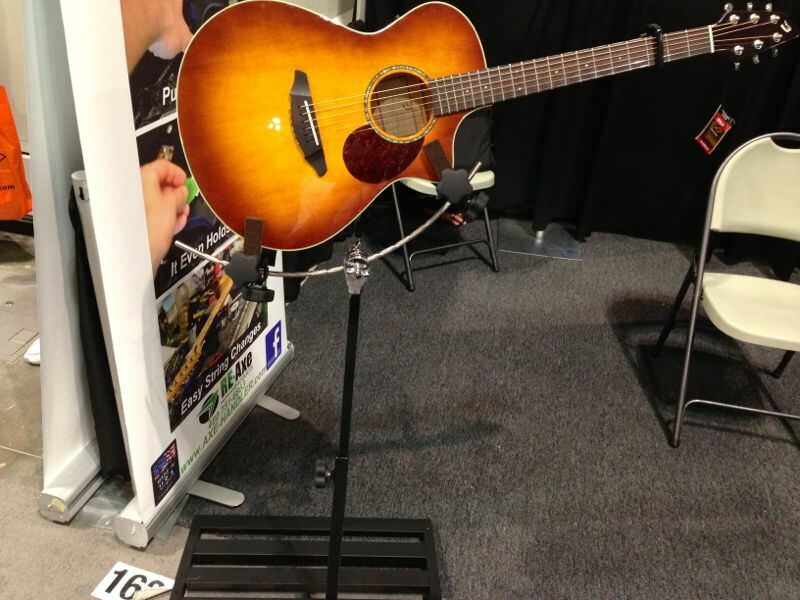 I first noticed the EDG Guitars booth because of the nifty folding guitar display. 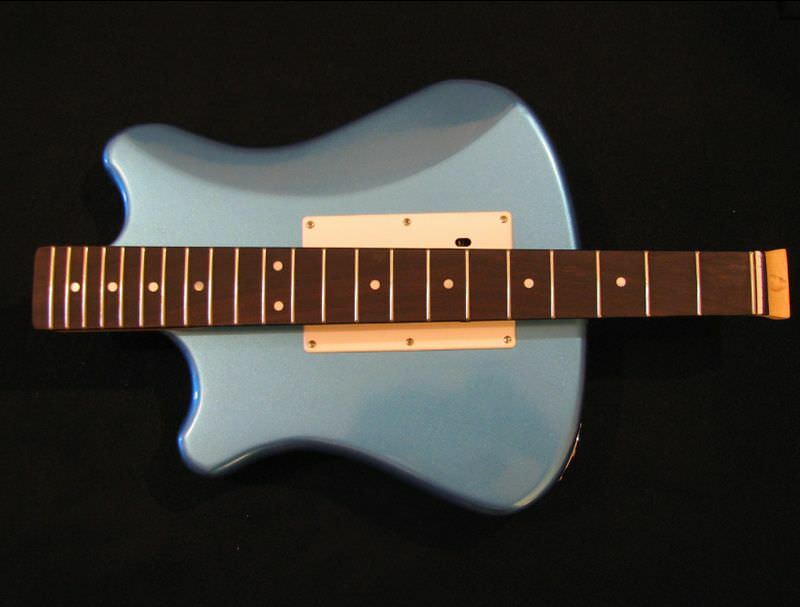 It’s a pretty cool design, a fully functional electric guitar with a very solid coupling mechanism at the neck/body joint. Even more impressive than the folding guitar was the prototype tuning machines he showed me. My current favorite tuning machines (Planet Waves) have an 18:1 ratio. That’s pretty good, but I find them….fidgety. I don’t know if that makes sense, but that’s the best word I can think of. EDG Guitars has come up with a new design for tuning machines that allows them to have a ratio as high as 100:1. If you understand that number, you’ll probably be asking “Won’t that require a lot of turning?”. Yes, and no. The tuning machines are designed to allow direct manipulation (through the back) using an Allen wrench. This is useful for quickly tuning a newly changed string. The primary tuning knob can then be used for ultra-precise adjustment. I forget who first told me about the Super-Vee Tremolo, but I finally had a chance to check it out for myself this week - very, very interesting technology. When you use the whammy bar on a normal strat, the bridge plate rotates against screws or posts. This is an imperfect mechanical connection and vibration is not transferred to the body very efficiently. The Super-Vee tremolo divides the bridge plate into two pieces. 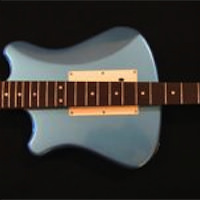 The front piece is attached solidly to the body, the other piece is attached to the tremolo block. Connecting them is a strong, yet slightly flexible sheet of metal that allows vibration to transfer between the two pieces. 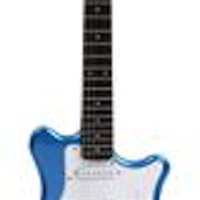 The Super-Vee guy told me that the difference is noticeable, even before the guitar is plugged in. Obviously the show floor was too loud for me to hear much of anything, but I wouldn’t be surprised if that’s true. Vibration loss is a sustain killer. Another surprise find for me was the Zoom H6 Recorder. 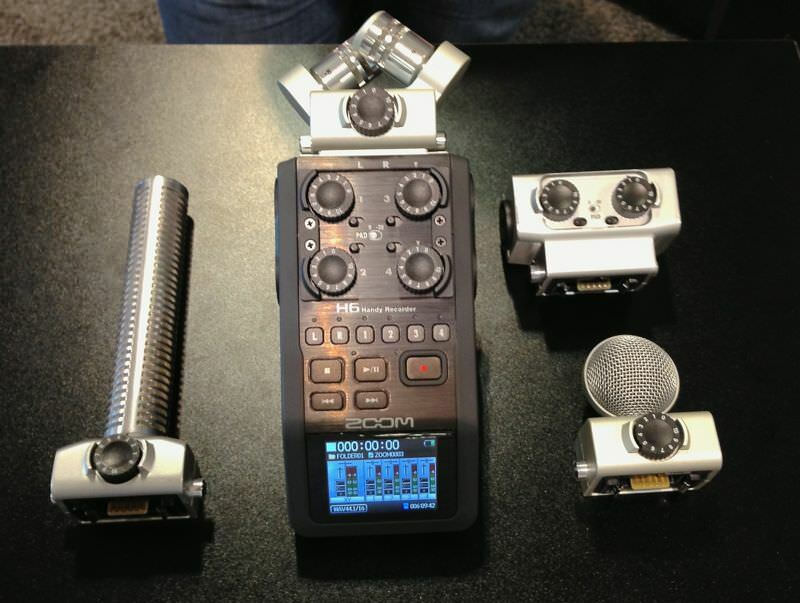 This fantastic device is a six-channel audio recorder with four built-in XLR mic preamps. 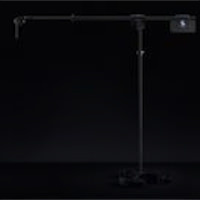 The top accessory dock pairs with a variety of microphones, or an additional set of XLR mic preamps. It has built in compression and limiting for the inputs (key for getting good signal levels), records up to 96kHz audio, and can even record backup tracks at lower gain levels. 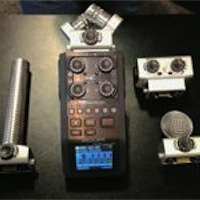 I’ve been looking for a way to record multi-track audio for my videos, and this device will allow me to do that without constantly walking from my camera to my computer. This show was surprisingly enjoyable and productive for me. Seeing my friends from other companies is always enjoyable, but some of the products I found are going to really impact how I produce my lessons and ultimately, what you see in the lesson videos.